Phillip Island has no hospital so please help to open a 24 Hour Medical Clinic. This challenge has been taken up by Amanda Drennan. 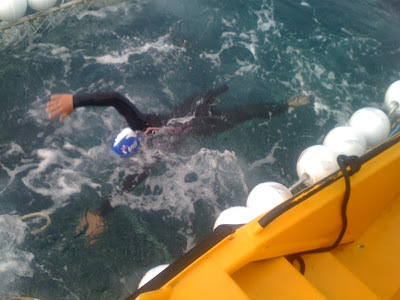 Amazingly Amanda will swim around Phillip Island and through Bass Straight in 4 to 5 days to raise funds. Amanda is a dual paralympic athlete who is putting her skills on the line to raise money and awareness for this vital 24 hour medical clinic on the Island. Please support her efforts with donations. The swim begins 16th March. Swim For Life, Phillip Island March 16th 2011 from fdelia on Vimeo. Sunday 20th March was a beautiful day. With blue skies, plenty of sunshine and flat water Westernport Bay looked beautiful. Mandy started her swim at 10am from Rhyll Inlet and we all estimated she would finish at 2.30pm on Sunday. It turns out the tide was seriously in Mandy’s favour and she was swimming too fast, so she had to slow it down so as not to get to San Remo too early. I was with a number of other people on the Kasey Lee following Mandy as she swam underneath the bridge. With the 80’s and 90’s blasting from the now familiar Swim for Life boat and Mandy powering towards the finish line the atmosphere could not have been better. It was around this time that the Channel 7 helicopter showed up to get some footage for the news that night. As Mandy passed the finish line at San Remo all of her supporters were clapping, beaming and yelling. The amount of support that locals and people from all over Victoria have given Mandy has been fantastic. After jumping out of the cage, giving medals to all of the volunteers who had helped her along the way Mandy gave interviews to the TV crews and people from the local paper. After all was said and done Mandy went home and returned to normal life preparing for university on Tuesday and nationals in a few weeks. She is the same as each of us with our day-to-day routines and challenges. The difference is that Mandy chose to make a difference. She completed an amazing feat on Sunday and became a local hero. So please do what you can to support Swim for Life and help Phillip Island get a 24 hour medical clinic. On Saturday morning Mandy and her support crew had an early start from Grossard Point. The pressure was on the reach Cowes where numerous supporters were waiting to greet Mandy on the jetty. The number of people who came out to applaud Mandy and donate to Swim for Life was fantastic. Once at the pier Mandy departed with the Turtle Smugglers (the local swimming group) heading eastwards towards Rhyll. They set a cracking pace but nothing compared to the pace that Mandy had maintained over the three previous days. 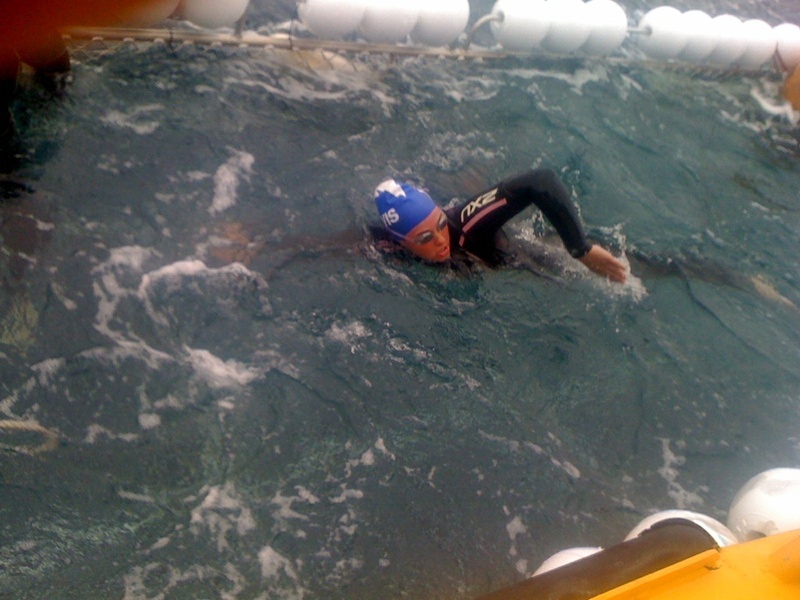 From Cowes Mandy continued to swim towards San Remo pier. Local MP Greg Hunt showed up and swam along with Mandy for 25 minutes. From there she continued for a few more hours until reaching Rhyll inlet where she was swimming against the tide. Seeing first hand the huge impact of the tide. 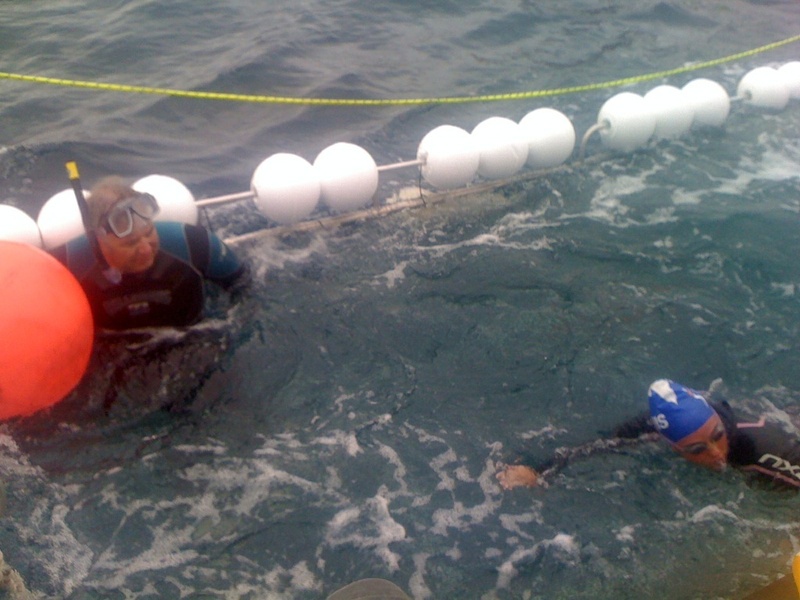 When it was in her favour Mandy swam up to 10km/hr but when she was swimming against the tide she slowed to 1km/hr. On Saturday Mandy swam over 15km leaving 13km for her finish on Sunday. Congratulations Mandy! You made it!!! Thank you for everyone who came out to San Remo Pier today to see Mandy complete her swim! It was great to see so much support! Blog and pics from the weekend to come! Mandy had another great day in the water. The sun didn’t manage to get out but she swam over 15km. She started back at Cape Woolamai (where she finished on Day 1) and swam along Woolamai Beach past Smiths Beach and Pyramid Rock to her finish point from Day 2. It was a slow start in the morning but by the arvo things were looking up. She swam at an average speed of 3.5 – 4 km per hour with the tide. Some curious dolphins and seals came to see who was swimming in their waters around Pyramid Rock. Tomorrow it will be another early start leaving from Grossard Point. From there Mandy will swim towards Cowes where she has invited anyone and everyone to come and swim a leg of the race for a $20 donation to Swim for Life. If you are keen come down to Cowes Main Beach at 11am on Saturday. For anyone who is going to be around Phillip Island tomorrow come and have a swim with Mandy as she swims past the pier. Donations of $20 per swimmer. You can donate using Pay Pal, using a direct deposit to the Trustee for Swim for Life account, visiting Bendigo Bank in Cowes or by sending a cheque. To help us keep track of people who are making donations please fill in the form by clicking on the link below. For all those on twitter!